Within its sport sponsoring program, Peta Zetas® will cooperate with the 3 artistic roller skating galas taking place next June in various towns in Toledo (Spain). The first one will take place in the town of Ocaña with participation of Sergio Canales (European sub champion) and Paula Naranjo (6th in Junior Europe Category) as well as some of the current champion show groups. 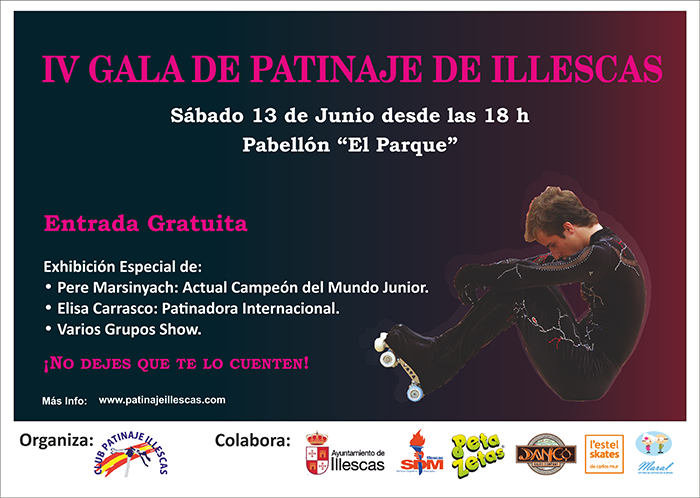 Just a week afterwards, on June 13th, Illescas in Toledo will host the IV Roller Skating Gala in the local pavilion. Audience will enjoy the performance of current junior world champion Pere Marsinyac, as well as the performance of the international skater Elisa Carrasco and other show groups. Fans of professional skating will also enjoy the VI Roller Skating Gala in Ontígola next June 20th. Renowned skaters like Daniel Arriola (9 times world medal winner) and international skaters as Elisa Carrasco or Laura Ruano and the Show Group “Reflections” (champions in Castilla-La Mancha) will participate in this show. Peta Zetas® is proud to cooperate in all these events, supporting them in their effort to win, and encouraging them to continue enjoying sport. Good luck to all participants!